During his lifetime, Samuel Clemens/Mark Twain watched young United States evolve from a nation torn apart by internal conflicts to one of international power. He experienced the country's vast growth and change - from westward expansion to industrialization, the end of slavery, advancements in technology, big government and foreign wars. And along the way, he always had something to say about the changes happening in America. Samuel Clemens was born on November 30, 1835 in Florida, Missouri, the sixth of seven children. At the age of four, Sam and his family moved to the small frontier town of Hannibal, Missouri on the banks of the Mississippi River. Missouri, at the time, was a fairly new state (it had gained statehood in 1820) and comprised part of the country's western border. It was also a slave state. Sam spent many boyhood summers playing in the slave quarters of his uncle's farm listening to tall tales and the slave spirituals that he would enjoy throughout his life. In 1847, when Sam was 11, his father died. Shortly thereafter he left school, having completed the fifth grade, to work as a printer's apprentice for a local newspaper. His job was to arrange the type for each of the newspaper's stories, allowing Sam to read the news of the world while completing his work. At 18, Sam headed east to New York City and Philadelphia where he worked on several different newspapers and found some success at writing articles. By 1857, he had returned home to embark on a new career as a riverboat pilot on the Mississippi River. With the outbreak of the Civil War in 1861, however, all traffic along the river came to a halt. In 1863 Sam began writing for the Territorial Enterprise, a Virginia City, Nevada newspaper where he used, for the first time, his pen name, Mark Twain. In 1865, his first "big break" came with the publication of his short story, "Jim Smiley and His Jumping Frog" in papers across the country. A year later, he was hired by the Sacramento Union to visit and report on the Sandwich Islands (now Hawaii). His writings were so popular that, upon his return, he embarked upon his first lecture tour, which established him as a successful stage performer. Hired by the Alta California to continue his travel writing from the east, Sam arrived in New York City in 1867. He quickly signed up for a steamship tour of Europe and the Holy Land. His travel letters, full of vivid descriptions and tongue-in-cheek observations, met with such audience approval that they were later reworked into his first book, "The Innocents Abroad", in 1869. Sam Clemens married Olivia Langdon (Livy) in 1870 and in 1871, in an effort to be closer to his publisher, he moved his family to Hartford, Connecticut. For the first few years the Clemenses rented a house in the heart of Nook Farm, a residential area that was home to numerous writers, publishers and other prominent figures. In 1872, Sam's recollections and tall tales from his frontier adventures were published in his book "Roughing It". 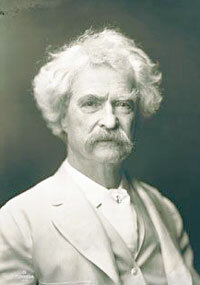 During the next 17 years Mark Twain completed some of his most famous works. Novels such as "The Adventures of Tom Sawyer" (1876) and "Life on the Mississippi" (1883) captured both his Missouri memories and depictions of the American scene. Yet, his social commentary was gaining force. "The Prince and the Pauper" (1881) explored class relations as does "A Connecticut Yankee in King Arthur's Court" (1889). And, in perhaps his most famous work, "The Adventures of Huckleberry Finn" (1884) Clemens satirized the institution of slavery and railed against the continued poor treatment of African-Americans overall. In the later years of his life Mark Twain's writings turned dark. They began to focus on human greed, cruelty and even questioned the humanity of the human race. Samuel Clemens died on April 21, 1910 at the age of 74.